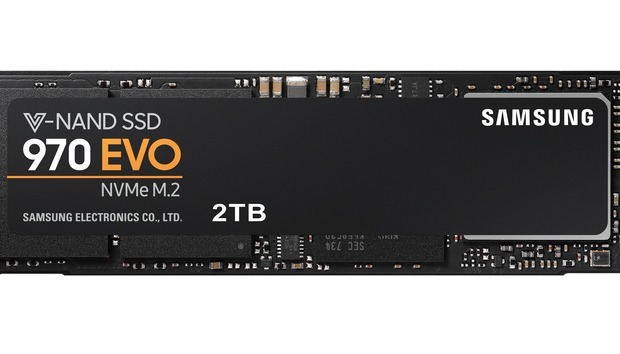 Samsung’s EVO series has owned the title of fastest TLC-based M.2 NVMe SSD since there has been such a thing. But unfortunately for the company, that distinction went the way of the dodo with the release of the WD’s game-changing Black NVMe earlier this month. Samsung’s response? The brand new 970 EVO. However, it’s a case of darn close, but no cigar—the Samsung 970 EVO outperforms the WD in several tests, but falls short in sustained write performance with larger amounts of data. That said, the shortfall is liable to affect few users. 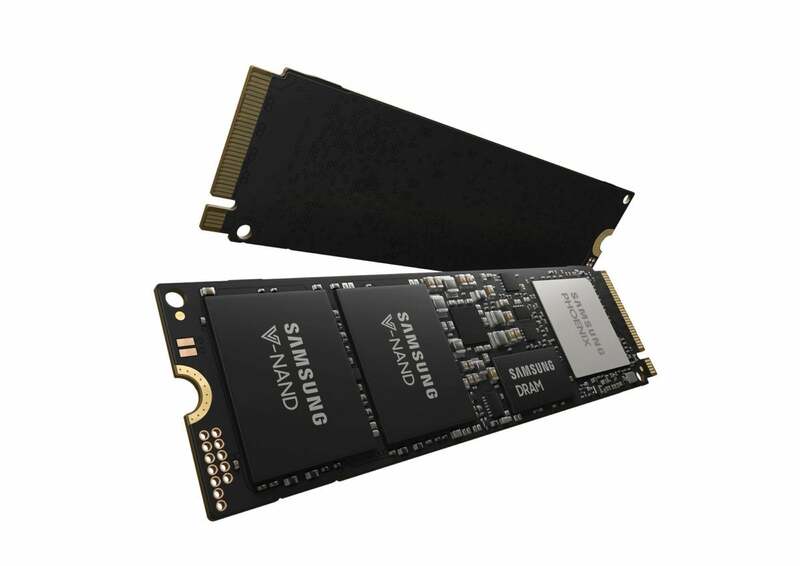 The Samsung 970 EVO is your standard M.2, 2280 (22 millimeters wide, 80 mm long), NVMe (Non-Volatile Memory Express) PCIe x4 solid state drive. That x4 means it can utilize four PCIe lanes for roughly 4GBps of available bandwidth, assuming a PCIe 3.0 connection. The drive uses Samsung’s 64-layer TLC (Triple-Level Cell/3-bit) NAND and is available in $120/250GB, $230/500GB, $450/1TB, and $850/2TB capacities. In terms of both price and capacity, that puts it in direct competition the aforementioned WD Black NVMe. You may see Samsung refer to its TLC NAND as 3-bit MLC. MLC stands for Multi-Level Cell, so by the letter of the language, they are correct. However, the acronym MLC is generally reserved for the faster-writing 2-bit NAND to which it was first applied. Long story short—the 970 EVO’s NAND is what is commonly referred to as TLC. Semantics aside, to overcome TLC’s write-performance handicap (writing three bits simply takes longer than writing one or two), the Samsung 970 EVO treats some of the TLC as SLC (Single-Level Cell/1-bit) by writing only single bit. This creates a much faster cache as shown in the chart below. Huge thanks to Samsung for this chart which shows exactly the amount of cache available for sustained writes, as well as what the speeds drop to when off cache. Kudos to Samsung for providing the information above. Most companies won’t talk about the amount of NAND cache they employ in their TLC drives, even though it becomes readily apparent during testing. Note that TurboWrite is the Samsung’s name for intelligently adjusting the NAND cache size for the amount and type of data being written. The Samsung 970 EVO also features DRAM cache to accelerate performance: 512MB on the 250GB and 500GB drives, 1GB on the 1TB drive, and 2GB on the 2TB drive. The front and back of the 970 EVO without the label. The 970 EVO is backed by a 5-year limited warranty and rated for 150 TBW (TeraBytes Written) per 250GB of capacity. I’m no Carnac the Magnificent, but it wasn’t that hard to predict the 970 EVO’s performance after testing the Samsung 970 Pro. 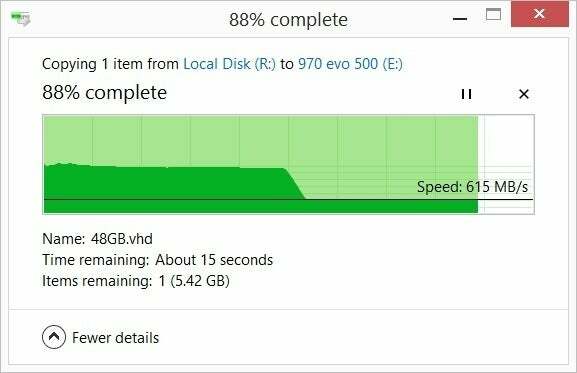 The 500GB EVO we tested performed on par with the 970 Pro and WD Black NVMe, and a little faster on one or two tests—right up until the time that it had to write a very large amount of data. Sustained write performance halved at about the 22GB mark of our 48GB large file copy test when the DRAM and NAND caches were exhausted. You can view the phenomenon below. 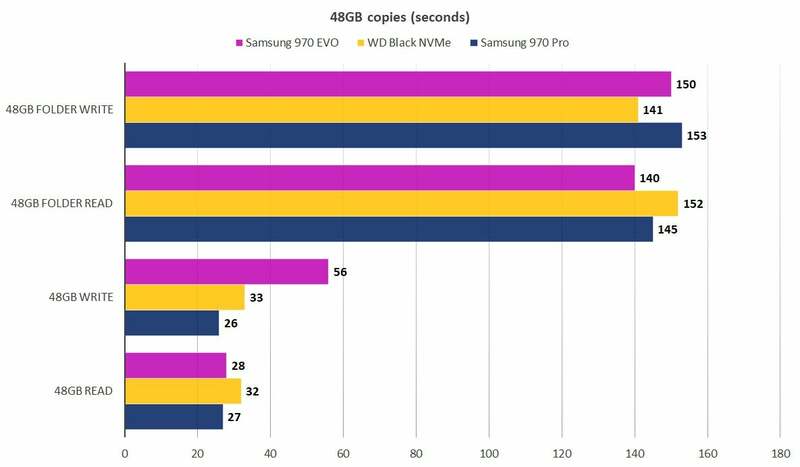 Reading the following charts, you’ll notice that Samsung’s pricier 970 Pro (dark blue) is clearly that fastest M.2 NVMe SSD available to consumers. But between the cheaper 970 EVO and the WD Black NVMe, it’s pretty much a toss-up until the 48GB copy tests, where the WD Black proved unquestionably the faster sustained writer of the two. CrystalDiskMark 6, which highlights small file performance with various queue and thread depths, thought more highly of the WD Black NVMe (shown in gold in the above chart). 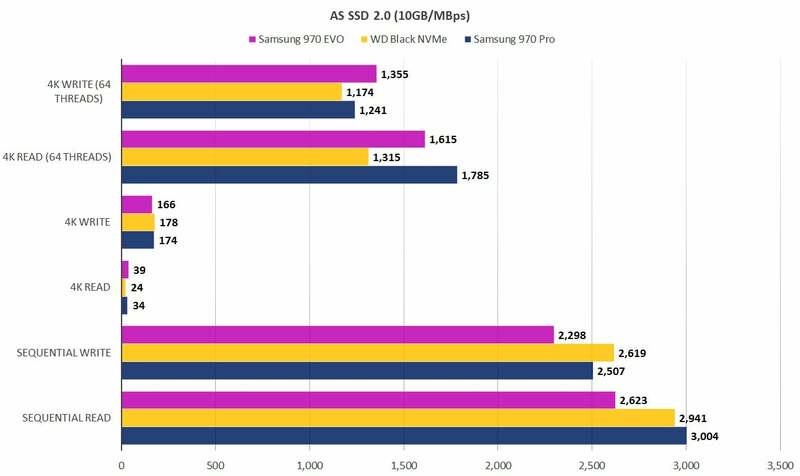 AS SSD 2.0 (below) on the other hand, liked the Samsung 970 EVO (violet) better when it came to small writes. Go figure. It was on our copy tests where differences between the Samsung 970 EVO and the WD Black became readily apparent. Still, this will only affect you on those rare occasions (for most users) when you copy large amounts of data, such as a game directory or a folder of virtual machines. If you go for one the 1TB or 2TB capacities, you’re unlikely to run into the sustained write performance decline at all. Samsung’s TurboWrite chart above will tell you exactly at what point the operation will fall out of the cache. The 500GB 970 EVO we tested ran out of cache, and steam for copying around the 20GB mark and its time suffered as a result. This is a tough call that’s mostly dictated on the performance differences at each capacity. In the 250GB and 500GB capacities, the WD Black NVMe has a slight edge for performance overall. At 1TB and 2TB, where the Samsung 970 EVO’s larger cache greatly reduces the chances of being overrun, it’s mostly a draw. That means your buying decision should mostly come down to which drive has the lower price when you’re shopping. PCWorld’s guide to the best SSDs has all the information you need to know about buying a new drive, including recommendations for top drives.